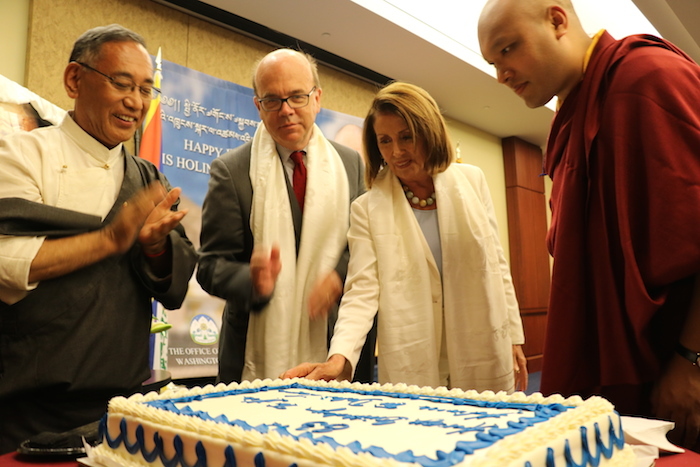 (TibetanReview.net, Jul14, 2018) – The Dalai Lama’s 83rd birthday was marked in the Capitol Hill, the US parliament building, on Jul 11 with the attendance of the Gyalwang Karmapa and over 150 friends and supporters, said the Office of Tibet, Washington, DC, Jul 13. Four members of the US Congress, including House Democratic leader Nancy Pelosi, joined the celebrations. Pelosi, recalling her 30-plus years of friendship, has wished the exiled spiritual leader of Tibet a long life. She and Congressman James McGovern have co-authored an opinion piece on the occasion of the Dalai Lama’s Jul 6 birthday, writing, “what a wonderful birthday present it would be, if China would treat the Tibetan people with the dignity and respect that they deserve, and let His Holiness go home to Tibet whether to visit or to stay.” The piece was seen posted on bostonglobe.com Jul 12, titled as ‘Let the Dalai Lama go home’. Congresswoman Claudia Tenney has called her recent visit to Dharamshala and meeting with the Dalai Lama a life-changing experience. She has spoken of being fully committed to doing everything possible to help Tibet. Carl Gershman, President of the National Endowment for Democracy, was stated to have called the Dalai Lama the foremost moral leader in the world today. Chen Guangcheng, an exile Chinese civil rights activist who made a sensational escape to the US despite being blind, has hoped that the Tibetan spiritual leader’s love for humanity will infect the people of China. And Matteo Mecacci, President of the International Campaign for Tibet, has reminded everyone to not be complacent and redouble our efforts to work on the Tibet issue. Dr Tenzin Dorjee, the recently elected Chair of the bi-partisan US Commission on International Religious Freedom (USCIRF), has spoken of having been advised by the Dalai Lama to demonstrate the Tibetan culture of peace, nonviolence and compassion in his new role at the USCIRF. US Ambassador-at-large for International Religious Freedom, Sam Brownback, and Congressman Ted Yoho were also stated to have joined the birthday celebrations. Thank you for supporting the Tibetans!! !